Would you like to increase the number of people who subscribe to your blog or email list? Is LeadPages worth it? And should you take out a LeadPages free trial? Now, I don’t like spending time coding or tinkering with the back-end of my website. I’d rather spend my time writing and building relationships online. I took a 30 day LeadPages free trial because I wanted a tool that would help me increase email sign-ups and create a landing page easily without hiring a developer. 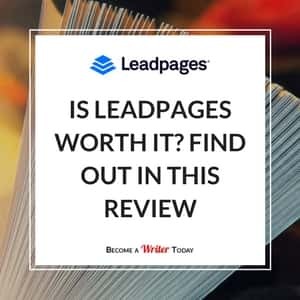 In this updated 2019 LeadPages review, you can find out why I’m still recommending this service to bloggers and writers who want to market their writing. In this Leadpages review, you can also read an interview with Tim Paige, who explains how you can use LeadPages to sell more books. Now let's dive into the LeadPage 2019 review. The main selling point of LeadPages is its ease of use. Using the drag and drop editor, it takes five minutes to create a landing and page that traditionally would have taken me several hours. Best of all, you don't need to know any code to do this. You can change and update these pages on the go and pick from popular templates that other writers and marketers love. LeadPages integrates with popular email service providers like MailChimp, ConvertKit and AWeber. It connects with WordPress via a plugin or, if you don’t use WordPress, it provides formatted HTML that you can copy and paste into the back-end of your website. LeadPages was established in 2010 by Clay Collins. It’s based in Minneapolis in the United States. To use LeadPages, you can pay a monthly subscription or take out annual plan with a discount. I don’t normally buy annual plans for my blogging tools. I only did this because LeadPages offer annual subscribers a discount. According to the LeadPages refund policy, they offer a 30-day money back guarantee and you can cancel at any time. If you want to know how to get LeadPages for free, just take out a LeadPages free trial. This landing page and the one pictured below took me about five minutes to create in LeadPages. I didn’t have to use any code to create this page. I was able to change the look of this page using the drop and drop editor, and I can see how the LeadPages is performing in real-time. LeadPages offers several dozen template landing pages, which you can sort by conversion rate. It also indicates the industry of each landing page so you can find one most relevant to your needs. I picked a template landing page for authors, and then I customised the colours, fonts and look and feel of this template. Using the drag and drop editor, this took me five minutes. Then, I pressed publish and LeadPages gave me a handy URL to use. If you use WordPress, you can connect to it via a plugin and publish directly on your site. 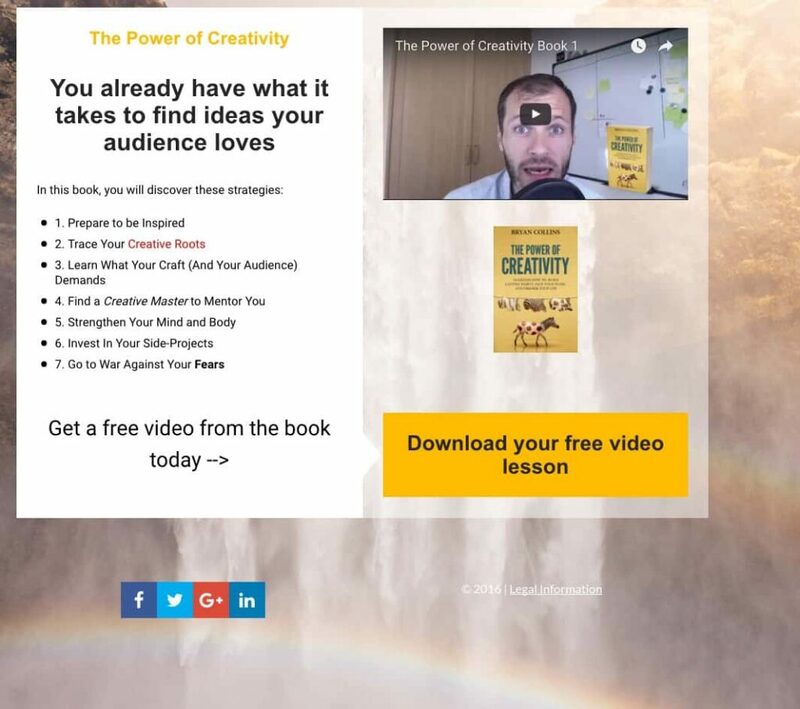 Then, I created pages for my new book The Power of Creativity. If this sounds complicated, don't worry. Any time I have had an issue with LeadPages, I contact support about it. They usually get in touch within a few hours to help. I also use Facebook ads to send paid traffic to this landing page and to increase sales of my book. I use LeadPages to grow my email list and also to sell books via advertising. You can upload text documents, audio recordings and video clips and use them as ethical bribes to convince readers to join your mailing list. LeadPages calls these Lead Magnets. Using Google Analytics, I determined the best performing blog posts on this website. I uploaded these giveaways using the editor. Next, I created a LeadBox in LeadPages. 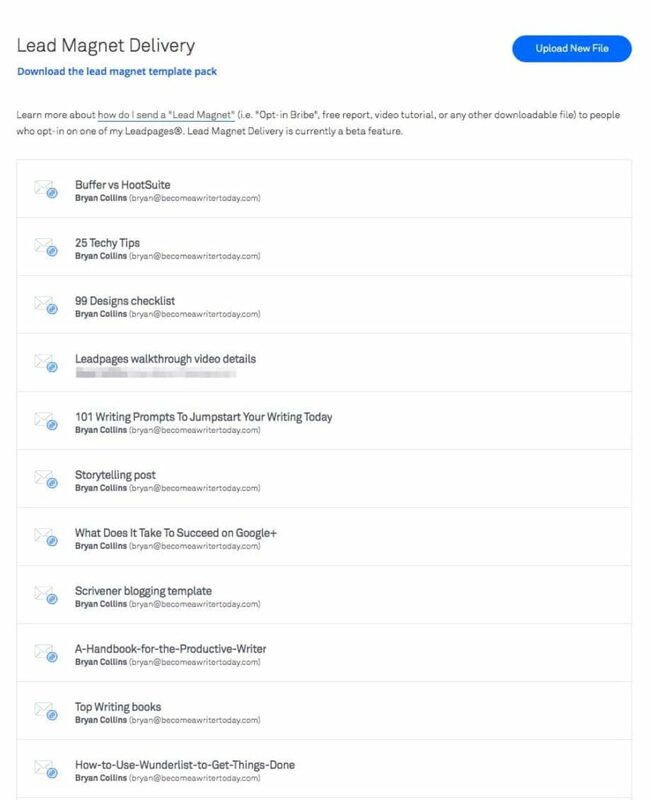 I styled these LeadPages LeadBoxes to match the look and feel of Become a Writer Today using the editor, and I used a drop-down menu to select relevant Lead Magnets for each LeadBox. I pasted the code for these LeadBoxes into my top five blog posts. Now, when new visitors land on my high-ranking blog posts and click on a link for these LeadBoxes, they are offered an ethical bribe or Lead Magnet. To get the PDF, audio recording or resources guide, they just have to opt in. When a visitor opts in, LeadPages automatically sends them the relevant PDF or MP3 immediately. Then, if they confirm their subscription to my Insider List, LeadPages adds their details to ConvertKit. Creating Lead Magnet links for my more popular posts helped me double my opt-in rates and lower my bounce rates. If all this sounds complicated, don't worry. The LeadPages for WordPress makes the process easy. I love analytics because I can see how my posts are performing and I can use this information to decide on what to write about next on Become a Writer Today. LeadPages provides easy-to-interpret analytics for each of the landing pages, popups and Lead Magnets you create. You can see how many people are subscribing via each LeadBox and which Lead Magnet is most popular. I’m already using these analytics to generate ideas for future pieces of high-value content and to improve existing calls-to-action. It also offers A-B testing for your landing pages, which is great if you want to test different calls-to-action or images on your landing pages. You should use LeadPages if you have a budget for a professional landing page tool. It will also help you grow your email list faster and convert more leads into customers. LeadPages will help you avoid spending time coding or building landing pages with HTML. It's purpose built for small businesses, bloggers and more who don't have time for technical challenges. For this LeadPages review, I also interviewed Tim Paige and asked him how writers can promote their work. In this interview, Tim explains how writers can promote a book online. 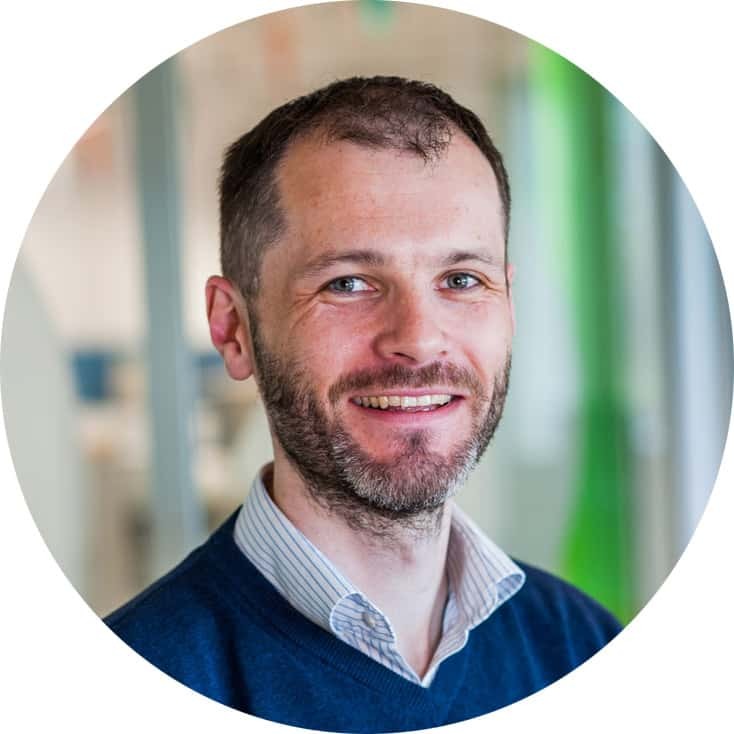 He also makes some interesting observations about why we should use analytics, and he offers his productivity tips. Q. 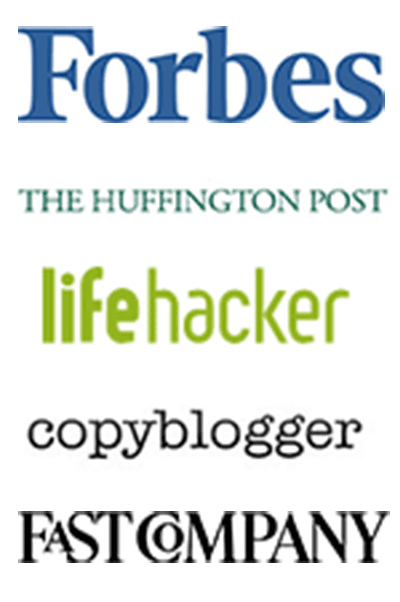 What's your number one tip for creating effective lead magnets? We've done a lot of testing and found that the highest converting lead magnet we've ever given away was a simple one-page list of tools. It was just a nice PDF with a list of a few resources that we used in our marketing. It out-converted a free video course, ebook, and hour long coaching call. Q. What types of customers do you have? Is it business people or individual bloggers or companies? We are absolutely honoured to have customers from all stages of business from bloggers to SaaS companies, info product marketers, coaches, large enterprise companies, real estate agents, dentists, e-commerce store owners, physical product creators really our customers come from a HUGE array of industries. Q. How can I use LeadPages to promote a book? The first way is to join me on a webinar by texting the word LeadPages to 38470 to hear some of the most powerful ways we've ever seen to promote a book (or any other product for that matter). But honestly, the answer to this question is much longer. What I would say is to focus on building an email list of your ideal readers who would read your book. Fans of fiction or non-fiction? Male or female? What age range? What are they passionate about? What do they get out of reading your book? Figure that out, and then offer them a chapter of the book in exchange for entering their email. Now you have a way to communicate to them in a way that builds trust. I will say that we have best-selling authors who use our template landing pages to promote their books. Specifically, if you're giving away a chapter and selling your book, I'd recommend checking out the ebook landing page we have by Pat Flynn. Q. How do you handle feedback about LeadPages? More and more people are finding out about LeadPages as a result of a webinar I've done, a podcast interview, or a live event I've spoken at, and as such, lots of people think of me as the “face” of LeadPages (which is humbling and frightening at the same time). This means I am constantly getting feedback about LeadPages and how it's helped people grow their businesses. Q. How important are analytics for you and your team? They're critical to us and should be critical for every business. If you aren't tracking what's happening in your business, how do you know what's working and what's not? We actually built a split testing tool into our software because of how important it is. Q. Do you have any productivity tips you can share? This is a constant battle for me (as I know it is for many people), but I can share a few things that have been working. 1) Prioritise. Sounds obvious, but this is something I struggled with for a long time. There are things that demand your attention right away but aren't truly that high of a priority. It's perfectly ok to file that away for later. 2) Don't be afraid to say no. I used to say yes to everything. Want to interview me on your podcast? Sure! Want me to personally look at your site and tell you what to change? Absolutely! But here's the problem with that. Saying yes to something will, in the end, mean you have to say no to something else. It might be an opportunity in your business, it might be to your family (more time at work = less time for other things), etc. I've learned to say no to things that drain my energy, or that I know would take me away from doing things that can provide value to a great number of people. 3) Get a scheduler and don't be afraid to make it limited. I have three accounts with ScheduleOnce. One to book interviews for ConversionCast, one to allow others to book me for an interview, and one for general meetings. If someone wants my time, they go through my scheduler. If they send me their scheduler, I politely ask them to please use mine instead as I know if I have to use theirs, I'll be tempted to shy away from the constraints I've put on my own scheduler. They're there for a reason. 4) Use the morning for your most important tasks. I find that right when I start the work day, I have the most energy, ideas, and enthusiasm. So I've stopped taking interviews then, I've stopped focusing on email, and started just doing things that are of high value and that will set me on the right path for the day. Q. What do you say to the blogger who is more concerned with social media than email marketing? You're missing out. I LOVE social media, I really do. It's such an awesome way to interact with people doing what they're already doing. However, it's not an asset that YOU OWN. If Facebook were to shut down one day… what happens to all of those fans? With email marketing, you own that list. It's yours. Start building your list TODAY. Every blogger should prioritise building an email list, and LeadPages is the ideal tool for growing that list. It's one of the most intuitive blogging tools I’ve used this year. Now, I spend less time tinkering with my site or creating landing pages. I didn’t have to spend much time reading tutorials or talking to the company’s support team. And it’s helping me increase subscribers to this blog. I like tools like this because they enable me to spend more time writing and less time staring at the backend of WordPress. So yes, for me LeadPages is worth it. However, if you want more control over the look and feel of your opt-in and landing pages, you will have to pay extra to upload your own. These are just minor quibbles, and I haven’t covered everything LeadPages can do in this review. You can always take out a LeadPages free trial (they offer a 30-day money back guarantee). Got questions about my LeadPages review? Share them below. 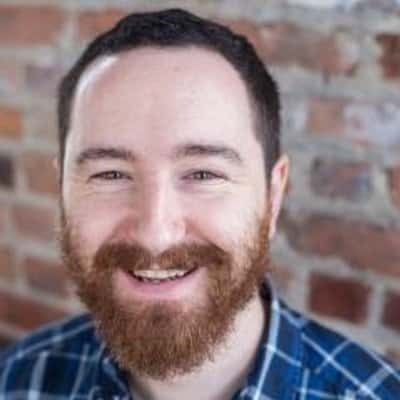 Tim Paige is the host of Conversion Cast and a Conversion Educator for LeadPages. LeadPages is a great tool if you want to create landing pages and sales page that covert and grow your email list fast. It's ideal for all types of bloggers. Thanks for this run-down. It’s going to be interesting to see how SaaS plays out over the long run, but for now the cons trump the pros for my needs. What would be interesting for a monthly service is set-up based on an analysis of the product and desired outcome. Another downfall I see here is that people quickly become blind to different capture pages, so the idea of “optimized conversion” is a bit of a false promise. After all, we’ve all seen the latest guru promoting a service like this only to have abandoned it by their next promotion when they’re using something else. Thus, what you use is probably secondary to how you use language and the communication of expectation and value to over the mouse your cheese. Language and words will always come first. I like Leadpages because writers, copywriters and online professionals can concentrate on writing their copy, sales pages and posts and not on the technical parts of these setting these types of pages up. Thanks for posting Anthony. I think it’s a good move to use these types of hosted opt-in type pages. As you mention they’re easy to setup, lightning fast load times and they look half decent. It’s happening now, but in the very near future those businesses that aren’t segmenting will loose prospective customers. Results rule and to get results you have to provide the right information, to the right person, at the right time. That’s how Google works and that’s what people want. This fast, easy method of creating opt-in pages lets anyone segment without fiddling with the technology, plus you get analytics. Your LeadPages popup loads fast. I haven’t found a popup plugin that will load that fast. Nice! Thanks Bill. Yes Leadpages is an impressive solution for relatively non-technical people like me. I want to investigate segmenting and so on. If or when I do, I’ll post back here. Thank you for the info. One question though. I just started using lead pages and need to design a guide/report cover for my landing page. Did you design your “Handbook for the Productive Writer” image outside of lead pages of inside? Yes I hired a designer on 99 Designs.com. There is a post on my blog about it. You can upload images to LeadPages and they will host it. LeadPages is always reviewing which landing pages are the highest converting, and you should too. Yes, they provide excellent resources and tips about conversions. I am using leadpages from quite sometime now and I find them to be the best company for increasing more leads and conversions. My business has increased to over 70% using them ! LeadPages is a great tool. I use it on various pages on and landing pages on this site. I like it because it’s easy and fast. Bryan, great post man! You did a great job of remaining objective and also very detailed. I would however challenge you to test Leadpages with Instapage http://goo.gl/XnCRIY. I think you’ll find the same template approach, but a very big difference in creative freedom and pricing (the free for life plan is a good start). We’ve seen a big majority of our over 100k users come directly from LP and I can tell you the differences are striking. Thanks man and again, awesome breakdown! I’ll take a look. Thanks for getting in touch Eric. Great post Bryan! We’re actually launching a marketplace dedicated to Lead Magnet templates over at http://www.marketingmarket.net. We would love your feedback and to find out what about the lead magnet creation process you spend the most time on? Also, what your process is like designing a lead magnet? p.s. This is one of the best reviews of Leadpages that I’ve saw! I’ll check it out thanks. I normally create Lead Magnets for high performing posts. I create checklists, PDFs, audio recording and other bonuses. I am a big fan of leadpages pricing. They are far better than any other company in the same market. I am sure many people will get value from your brief review. The thing about leadpages is they sort templates by conversions so if you choose one that is high up on the list then you can be relatively certain that the template will serve you well. That has been my experience when testing against some optimize press pages I built with almost identical content. I have only used the free templates so far and while they are not that visually impressive they convert. I like LeadPages because it’s easy and fast to use. I know there are templates but LeadPages works and works very well. Sorting by conversions is a clever feature too. Hi Brian, I really learned alot from your article. Just a quick question. After paying the annual subscription with Leadpages, can I create unlimited opt-in pages for unlimited websites? Sorry to hear you’re having problems with it, their support is quite good (particularly the live chat). Everything you said about Leadpages is true and I use it as well. The one BIG frustration I have is the lack of an “undo” function. One mistake and it’s unchangeable, which leaves you no option but to start over. A lot of time can be lost – ask me how I know! There are many frustrating posts from people about this on their site. I fought LeadPages for years… why pay perfectly good money for something I can so easily do myself? So, yeah… IMHO, LeadPages is the way to go. I agree, if it saves time, it’s usually a good idea. Founders/Innovators can submit their startup, for getting feedbacks, beta subscription, early adopters, traffic and users. Nice review! Somewhat randomly I saw yours as I was also finishing up a Leadpages review of my own. It doesn’t go to the lengths that yours does but covers a different industry, basketball. I laid out the results we got for one campaign we did with the numbers including click through rates, conversions, etc. I am sure after reading this post people may aware of increasing the subscriber’s list in an easy way. Every steps and idea of Lead magnets really give a sparkle on everyone to generate a good subscribers list on their blog. And besides, each interview questions you posted gave me more information and helped me to kickstart my productive business. Growing a list is easier with LeadPages. I’ve been using it for a while now. I’m happy you liked the interview with Tim, he shared some smart tips. Thanks for the post, as a newbie really helpful for me i am sure that i will increase subscribers. Glad you liked it Vijay. I get my landing pages done on fiverr at fraction of cost. I am huge non-believer in monthly subscription model. Nice review Bryan with lots of useful insights. I basically started with Instapage first, after subscribing to Leadpages for couple of years I have become a fan of Leadpages. Though the price they offer is little expensive but it is worth the money. Yeah I thought it was expensive when I first bought it, but I’m still getting great value from it today. You have written a very detailed review Bryan. I want to suggest you that you should make your website HTTPS complaint so that you can get organic boost and also Google Chrome has started not secure for your website. Nice review!Really amazing content. The tips you presented are great. 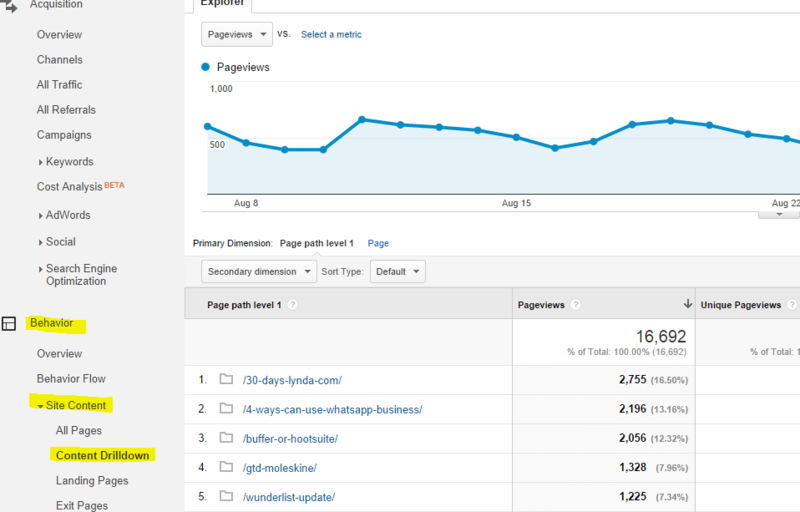 It is amazing how many things can affect your ranking and overall traffic?